Many blame today's economic inequality, stagnation, and political instability on the free market. The solution is to rein in the market, right? Radical Markets turns this thinking--and pretty much all conventional thinking about markets, both for and against--on its head. The book reveals bold new ways to organize markets for the good of everyone. It shows how the emancipatory force of genuinely open, free, and competitive markets can reawaken the dormant nineteenth-century spirit of liberal reform and lead to greater equality, prosperity, and cooperation. Eric Posner and Glen Weyl demonstrate why private property is inherently monopolistic, and how we would all be better off if private ownership were converted into a public auction for public benefit. They show how the principle of one person, one vote inhibits democracy, suggesting instead an ingenious way for voters to effectively influence the issues that matter most to them. They argue that every citizen of a host country should benefit from immigration--not just migrants and their capitalist employers. They propose leveraging antitrust laws to liberate markets from the grip of institutional investors and creating a data labor movement to force digital monopolies to compensate people for their electronic data. 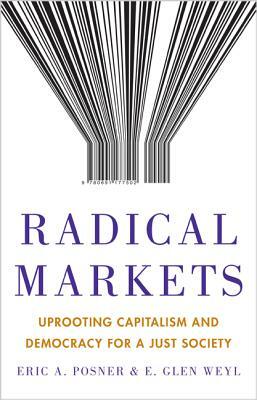 Only by radically expanding the scope of markets can we reduce inequality, restore robust economic growth, and resolve political conflicts. But to do that, we must replace our most sacred institutions with truly free and open competition--Radical Markets shows how.